If your legs ache and feel heavy after exercising, you might attribute your symptoms to something minor like wearing the wrong shoes. Many people experience aches and pains after physical activity, especially when they begin a new exercise program. However, do not ignore a persistent and chronic aching in your legs, as it could be a sign of a more serious condition. If you have persistent leg pain, consult your doctor. 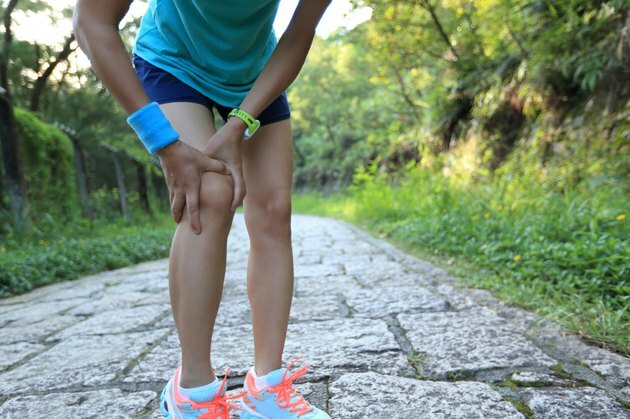 Aching legs are also described as feeling numb, heavy, frozen, or having "pins and needles." You may also notice swelling or bruises. Leg pain can involve muscles, ligaments, tendons, or fascia, the soft connecting tissues near your bones, muscles and organs. It may also stem from an underlying circulatory disorder. Excessive exercise can lead to soreness and muscle cramps. Runners, especially, experience pain as a result of pronation, when your ankles rotate inward at the subtalar joint while you walk or run, straining your lower legs. Other reasons for achy legs after exercise include varicose veins; fibromyalgia; electrolyte imbalances, including insufficient potassium or calcium; and exercise-induced rhabdomyolysis, a condition where muscle cell fluids are released into your bloodstream during exercise. Two of the more serious causes are a blood clot, and peripheral artery disease, better known as PAD, caused by a buildup of plaque in your leg arteries. PAD leads to narrowed or blocked blood vessels, and limits the amount of blood circulating through your legs. One of the characteristic symptoms of PAD is intermittent claudication, or leg pain or weakness when walking or climbing stairs that goes away at rest. Ironically, exercise can be a way to help treat PAD. Researchers at the University of Florida's College of Health and Human Performance studied the effects of low-intensity exercise on PAD. Their results, published in the April 2009 "The Physician and Sportsmedicine" journal, showed that walking on a treadmill twice a week for six consecutive weeks led to a 148 percent improvement in the distance patients were able to walk, a 34 percent increase in speed and a 94 percent increase in duration of walking. Quitting smoking, losing weight and controlling your blood-glucose levels through a healthy diet will all help prevent aching legs. If you suffer muscle aches from overuse, apply ice and take aspirin or ibuprofen. Aching from fibromyalgia can be treated with similar over-the-counter pain relief and gentle stretching and massage. If your ankles overpronate, consult the salespeople in an athletic shoe store for the appropriate footwear. If you have PAD, aspirin and cholesterol-lowering drugs may help increase you ability to walk longer distances without aching, but if you experience severe dizziness, shortness or breath, pain, fever, swelling, or warmth or discoloration in a leg, consult your doctor as soon as possible.